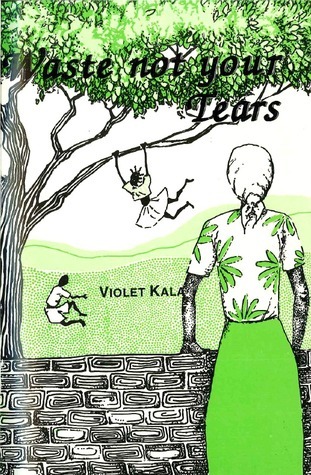 Set in the 1990s Zimbabwe, Violet Kala’s Waste Not Your Tears, is the moving story of a powerless African woman who – thanks to both her own folly and circumstances beyond her control – inevitably succumbs to the cruelty, dirt, and filth of an unfriendly urban lifestyle. As a teenager, Loveness (despite much effort from her parents and relatives), fueled by adolescence and peer pressure, decides to abandon school and heads to Harare. The charming city has its sizable share of disenchantment, yes; yet Loveness is determined to milk any morsel out of it with exaggerated vigor. It does not take long for Loveness to fall in love headlong with Roderick, a serial cheat who is not only HIV AIDs positive, but also too willing to flex his sinful muscles. Loveness thus finds herself, unknowingly, unthinkingly, both HIV AIDs positive and pregnant. The child does not survive, and when Roderick is cornered, he accepts to take a test, which confirms his fears and those of his employers’ (ironically mandated to wage an all-out war against the HIV AIDs scourge. It is the traditional beliefs of the 1990s Zimbabwe (which greatly hindered the efforts of agencies fighting the spread of HIV AIDs), and the powerlessness of a woman who is virtually at the mercy of a male dominated society, that worsens Loveness’s predicament. Once cornered, having endured a bittersweet marriage that was heavily punctuated with violence, negligence, and tears, Loveness decides to take the charging bull by its horns. Once resigned to her fate, she becomes a champion against the spread of HIV AIDs and is rewarded by a fully funded trip abroad to give a talk on the HIV menace. Meanwhile, Roderick sinks into oblivion as the scourge takes its toll on him. This book not only highlights the plight of HIV AIDs victims in Africa, but also offers implicit solutions that can help African countries still battling to eradicate the scourge. It is a teary story that will break your heart, yes, but it will also remind you that we still have a long way to go as far as winning the war against HIV AIDs is concerned in Africa. Levi Cheruo Cheptora, a writer, poet, recorded singer, and freelance journalist, is based in Nairobi, Kenya. His publications are available on Amazon.com.